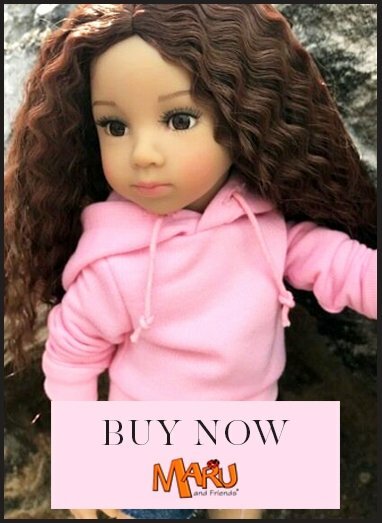 If you wish to order this doll please contact us. Jenny Frieske by Schildkrot is such a beautiful, happy doll she makes you smile with her. Jenny comes with her dog of course. The puppy love theme is carried from her clothing which depicts girls and their puppies. The fabric has the feel of Summer - well, what else do you think of but hazy Summer days when you see camper vans! Jenny was sculpted by artist Sieglinde Frieske in Germany. Her head is fitted into a chest plate and it can be moved around into different positions. Jenny can be made with sitting legs or standing legs if preferred. She can bring her legs and arms into different positions, but if she has sitting legs she will not be able to stand. She has a blonde, hand-knotted human hair wig and mouth blown glass eyes from Lauscha. She has a blonde long, handmade, real human hair wig. She wears a very fashionable outfit and comes with a teddy. The doll is limited to 999 pieces and comes with a certificate. Warning: This is a doll collector's doll.